We now have Eyemaginations at all three of our locations. This is a computer software program designed to assist the doctor in educating patients on a vast variety of eye health issues. It also assists when choosing eyewear by allowing patients to see in 3D available lens options and treatments. We are pleased to announce that we have a brand new Optomap Retinal Scanner at our Liverpool location. While our eye exam includes a look at the front of the eye to evaluate health and prescription changes, a thorough screening of the retina is critical to verify that your eye is healthy. This can lead to early detection of common diseases, such as glaucoma, diabetes, macular degeneration, and even cancer. The exam is quick, painless, and may not require dialation drops. We are pleased to announce that our Liverpool location has new, state of the art edging equipment, allowing us to execute the edging required for a large number of plastic lenses. We carry in stock a large variety of single vision lenses with scratch resistance and reflection free lenses. This allows us to fill most simple eyeglass prescriptions within one hour. The edging process begins with a form tracer that will trace the shape and size of your frame which will ensure that your lens is well positioned inside your frame. The edger then cuts the lens to specification and after a final inspection the lens is fitted into your frame. In October 2008 we upgraded to a new fundus retinal camera. This new fundus camera will take clearer and sharper images as well as allow us to get clearer pictures of patients that have small pupils. The software associated with the new camera also has some improvements. All pictures taken from the previous camera are compatible with the new one, so we will still be able to compare your most recent photos with the ones we have on file. We are very excited to be able to provide our patients with the most recent technology. 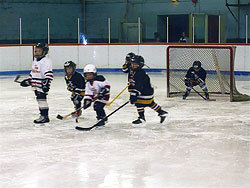 On Saturday, April 7 we sponsored a Timbits hockey game at the local arena. The kids had a great time playing in this fun, non-competitive event. After the game, juice and cookies were served to all the players. 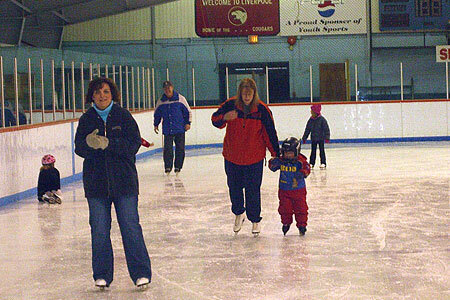 On April 7, 2006 we held our first Free Skate at our local arena. Approximately 60 people attended the event and a great time was had by all. People were asked to bring a non-perishable food item which was greatly appreciated by our local food bank. We would like to extend our appreciation to all that attended. In June of 2005 we added a Digital Fundus camera to our pre-screening examination. This piece of equipment will photograph a 45 degree field of the back of the eye (retina). This permanent photographic record will be added to your file and can help in tracking changes in the appearance of the back of the eye. During your eye examination, your optometrist will show you your photographs, which may capture signs of diabetes, high blood pressure, glaucoma, macular degeneration or other eye diseases. © • Liverpool Eye Care Center | Optometrists in Liverpool, Nova Scotia | Created by Optometric Services Inc.